Extended semi detached bungalow situated in the popular location of Moor Lane, St Budeaux wihin close proximity to a variety of local amenities including a local post office and access to public transport routes. The property has been extended with the addition of a wonderful and generous conservatory which overlooks the rear garden. Living accommodation comprises, spacious lounge, conservatory, kitchen/breakfast room, two bedrooms and modern bathroom. 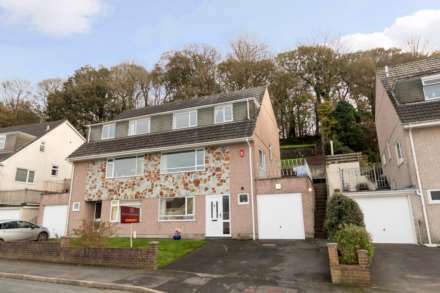 The property also benefits from front and rear gardens, double glazing, gas central heating and is offered to the market with no onward chain. Generous lounge with ample room for lounge furniture. Wood effect flooring, window to rear aspect. Double doors leading to conservatory. Spacious conservatory with pitched glazed roof. Wood effect flooring. Double doors leading to rear garden. Space for dining table. Range of modern wall and base units with complimentary worksurfaces and tiled splashbacks. Integral four ring gas hob with electric oven under and circulation hood over. Integral sink drainer unit with mixer tap and tiled splashbacks. Integrated fridge/freezer. Space and plumbing for washer/dryer. Feature box window with built in seating area. Double bedroom with feature bay window overlooking the front garden. Double glazed window to front aspect. Access to loft space. Three piece bathroom suite comprising, white panelled bath with electric shower over. Pedestal hand wash basin. Low flush w.c. Frosted widow to the side aspect. Extractor fan. Steps with hand rails to either side lead to pathway and front entrance. Garden to either side of pathway mainly laid to lawn. Enclosed rear garden mainly laid to lawn accessed via the side of the property or conservatory. Space for storage shed.